Governance has become a hugely important issue within sport. Issues of corruption and ‘bad governance’ have become synonymous with some aspects of sport and closer scrutiny than ever before is being applied to ensure organisations are following international best practice in respect to how they are governed. As sport organisations are required to become more professional and to adopt a more transparent and accountable approach to their operations, it has become important for all students, researchers and professionals working in sport to understand what good governance is and how it should be achieved. This book is the first to examine sport governance around the world. 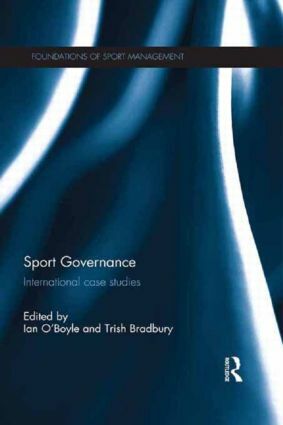 It offers a series of in-depth case studies of governance policy and practice in 15 countries and regions, including the US, UK, China, Australia, Canada, South Africa, Latin America and the Middle East, as well as chapters covering governance by, and of, global sport organisations and international sport federations. With an introduction outlining the key contemporary themes in the study of sport governance, and a conclusion pointing at future directions for research and practice, this book is essential reading for any course on sport management, sport policy, sport development, sport administration or sport organisations, and for any manager or policy-maker working in sport and looking to improve their professional practice. Ian O’Boyle is a lecturer in sport management in the School of Sport and Exercise at Massey University, New Zealand. His major research interests focus on the governance of sport organisations and broader sport management topics. Trish Bradbury is a senior lecturer in the School of Management at Massey University, New Zealand. Her major research interests concern a variety of aspects of sport management related to sport governance, event management, people management and strategic management in non-profit sport organisations.